Heads Up…Look What’s Coming Up! 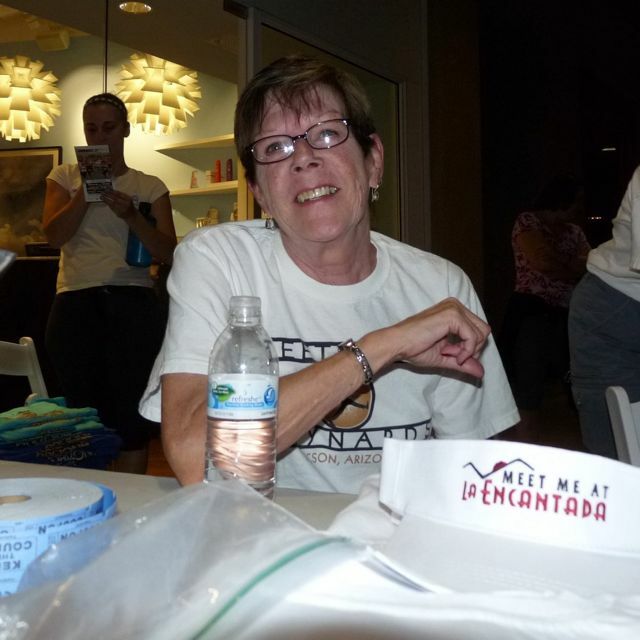 Meet Me at La Encantada (MMLE) meets every Wednesday and is FREE. Check-in from 5:15 to 6:30 pm. Walk, run, Walkout and MMLE Strength every week, and more on alternating Wednesdays. Restaurant discounts with MMLE hand stamp. and the family dog! Just be there! Fini’s Landing joins the MMLE family of restaurants with great deals and music! throughout the route (see map below). but there won’t be anything usual about it. See map of bands above. BBQ in the courtyard…only $9.00!! Click here for detailsComments? Questions?…just reply to this email. Menu & Specials on their website. Guess the exact location of the picture below and you could win a 10 class pass to any group fitness class from O2 Modern Fitness! Go to the TucsonOrtho Facebook page and “Like” us to submit your answer orCLICK HERE to enter now. Congratulations to Heather Wuelpern for correctly guessing the location of our Move It Mystery Shot for March! and on TucsonOrtho’s Facebook page. Join our TMC/”Meet Me” team!! TMC invites MMLE to join them at the Heart Walk. The Heart Walk is at Reid Park Saturday, April 20. Celebrate those who have made lifestyle changes and encourage many more to take the pledge to live healthier lives while raising dollars to fund life-saving research. Bring the whole family…and your dog. To join our team click here! Check in at home or on your smartphone. after 3:00 pm on Wednesdays! The summer route offers amazing views, breathtaking mountain vistas and great opportunities to visit with your MMLE friends. 1. Run on sidewalks on Campbell Ave.
2. Cross only at the light. 3. Run on the left side of the neighborhood road – FACING traffic. You must be able to make eye contact with oncoming traffic. You may wink at them if you wish. 5. Smile at the people in the cars. Getting Out is fun! Awaken every muscle in your body with the most simple and effective body-weight exercises! WalkOut this week with Dr. Jon Wang or Dr. Jim Hudson or Dr. Rick Langert, or all of them, assisted by Nancy Milburn, Melanie Tschoppfrey and Jannie Cox.Bring your questions about fitness and exercise and ask a doc. The WalkOut is a 1.5 mile walking workout, finishing withstair repeats…yes, as many as you can handle!! helping us create the WalkOut. 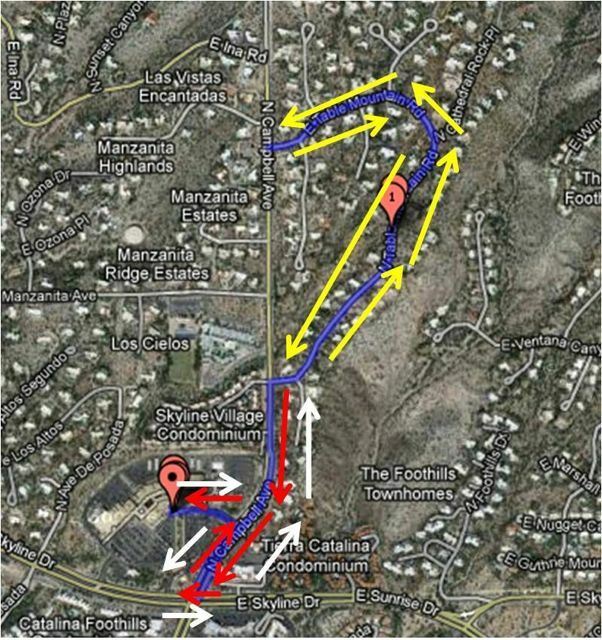 Click here for more complete description of exercises and route. Laurie gets her shirt just in time for her, umm, 29th birthday party in Vegas! Will gets a well deserved GET OUT from the crowd upon receiving his 50X Pin! Monica, Linda & Gina always look good! Hmmm, a shirt? For me? Awesome! Yes, it’s the Aveda Gift Bag – and yes, you won! Many of our runners this week were Army & Navy recruits. Thank you for your commitment! Yes, this picture above, and the picture below are the views we get every Wednesday! Nancy is a great cheerleader! computer or on your phone. really is the best medicine. Happy Hour menu ’til close!! Armitage extends Happy Hour pricing until 8:00. Details on website. Click on “discounts”. RA Sushi offers 15% discount with your MMLE hand stamp! Enjoy their happy hours prices til 7:00, then use your MMLE discount! Offering 20% off dinner and drinks on Wednesday nights, excluding happy hour items. Also includes an additional 10% off any breakfast, lunch, or dinner, which can be used within the following six days to those who present their receipt from the previous Wednesday meal. This discount also excludes happy hour items. Happy Hour to close and 15% off dinner menu. MMLE is seeking a few good volunteers who want to see a healthy and fit Tucson. Every volunteer receives three raffle tickets for the drawing. Such a deal!! Just reply to this email and let us know that you would like to help. Thanks a bunch! MMLE is brought to you by Meet Me Concepts. RECORD YOUR WALKS/RUNS FOR MAYNARDS TO THE MOON. Meet us in the courtyard of St. Philip's Plaza near Reforma. After your walk/run join us at 6:30 pm for closing ceremonies…incentive awards and prizes. © 2019 Meet Me Wednesdays.